We took Brendan on his second fishing trip in the boat on Monday evening. While he didn't last very long in the boat, we all managed to have a great time. He even practiced holding a real muskie fishing pole...with momma right next to him! Brendan loves going to the beach!!! Sitting in his spot on the couch...he got up there all by himself! 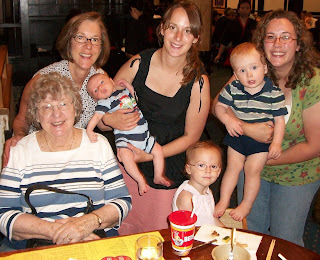 Out to lunch with Great Grandma Thon, Grandma Ginny, Auntie Casey, Cousins Layney and Liam and Mommy at Bennihana's. Riding on the carosel at Mall of America with Grandma Ginny. It has been a very busy, very wonderful summer for us here at the Lindberg household. Many family get togethers, lots of fishing and duffels bags that never seem to get unpacked before they are used again. Weddings, fishing trips, family reunion vacations, biking around town, playing in the pool in the backyard, Kids day at the County Fair, antique shows, going, going, going all summer long. It's been fun and crazy all at the same time! B is getting bigger and bigger every day and is showing us just how smart he is every day. He now uses sign language to say "more" whenever he wants to more of something...food, playing with toys, reading books...it's totally awesome and used often! He is a climber. We find him in places that he should not be. He escaped from the house a few evenings ago while I was bringing something from the garage to the backyard and when I returned to the house, he was nowhere to be found. I looked out the front door and there was a toy on the top step. (I had left the strom door closed, but he figured out how to hit the knob to open the door!) He was exploring the garage and some fun styrofoam on his own. Mommy was having a heart attack, but he was all smiles! OY!